How does *The Pioneer Woman’s* Cinnamon Roll recipe rate? 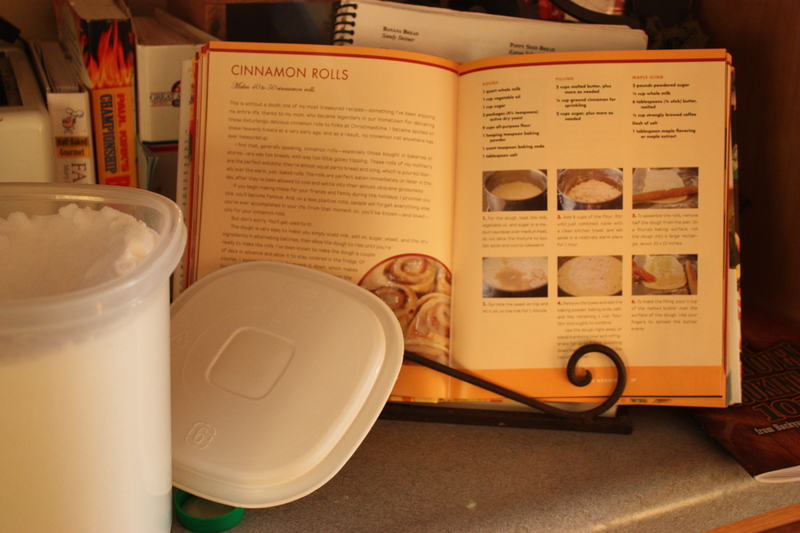 I’ve been dying to try The Pioneer Woman’s Cinnamon Rolls. The dreams about her rolls got too intense that I had to do something about it. I’ve been so short on time lately that even though I wanted to keep the recipe true to the core but needed a short cut. I resorted to using the, gulp, bread machine. I generally only use it making the dough and prefer to bake in the oven. I couldn’t find a cinnamon roll settling so I settled for plain old dough…LOL! This recipe is from Ree Drummond’s (aka The Pioneer Woman) cookbook, ‘The Pioneer Woman Cooks,’ which came out last fall. If you do not have a copy I highly recommend getting your hot little hands on one. I wanted it so badly, I received two copies for Christmas. They are available at Barnes & Noble and some selected Walmart stores. I’m sure there are other locations too…just Google “The Pioneer Woman Cooks.” I’ll warn you, butter is a main ingredients in many of the recipes but that’s what makes them so yummy! Keep in mind that due to the size of my bread machine, I modified the recipe a bit cutting each ingredient in half. I’m going to list the ingredients as used in this new bread machine version. 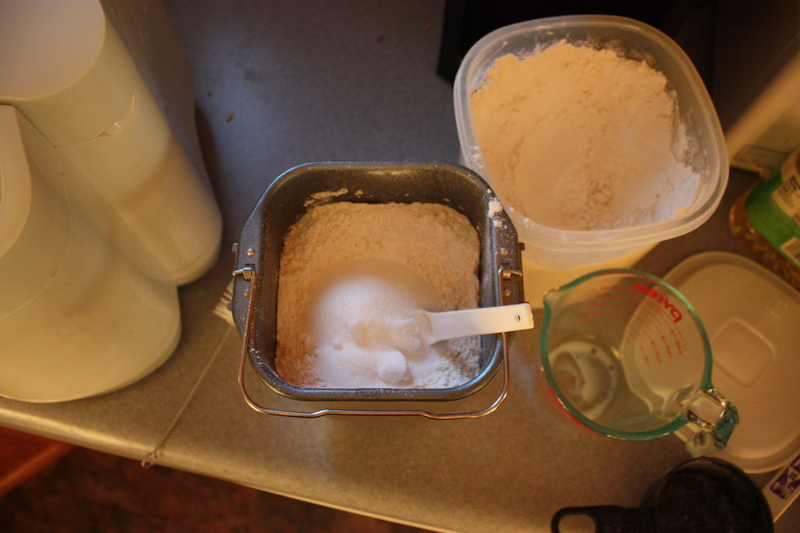 Add dry ingredients after the wet ingredients. Drill a hole with your pointer finger for the yeast...fun job for the kids! together. 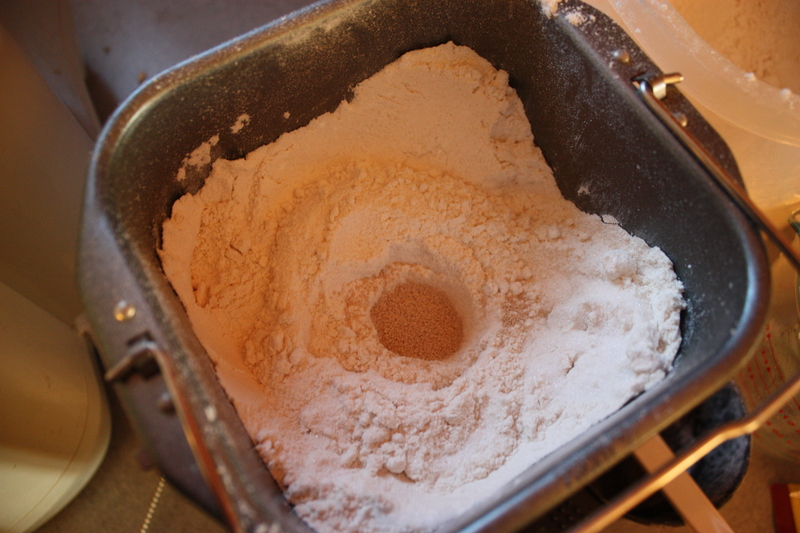 Next, drill a hole in the dry ingredients. Pour the package of yeast into the hole. Select dough on your bread machine and then start. Presto, you are on your way to fresh cinnamon rolls. I started my machine mid-afternoon, ran a couple of errands, made supper, put the boys in bed and then attended to the dough. I normally wouldn’t let it rise that long but in this case it needed the extra time. Next, you will need to flour a clean surface where you will empty the bread pan. Begin kneading the dough until it’s smooth and elastic but try not to handle the dough too much. In my experience with yeast breads, less is more. Overly handled dough results in tough, heavy rolls or breads. Then using a rolling pin, roll the dough into a rectangle shape. To make the filling, melt 1/2 cup of the butter and spread evening over the dough. Generously sprinkle half of the ground cinnamon. I can not emphasize this enough. I thought it would be too much. In retrospect, I didn’t have enough in my rolls. Follow up with sprinkling on 1/2 cup of the sugar. As Ree says, if you feel the need to add more butter and sugar, go for it!! You then need to begin rolling the dough to form the log. I roll my logs opposite of Ree and begin with the side closest to me whereas, she begins with the farthest side. The implications of doing this differently? I’m not sure. The next time I make the rolls, I plan to roll the Ree way and investigate. Either way you choose to roll your dough, you’ll need to pinch the seam together once you’ve reached the end. Transfer the log over to a cutting board and using a sharp knife begin cutting 1 1/2-inch slices. One log will produce 20-25 rolls. Now pour a couple of tablespoons of the melted butter into your baking dish and coat evenly. Place each of the slices into the pans, being careful not to overcrowd…Amen! Repeat until all slices are in the pans. Preheat your oven to 375 and cover the rolls with dish towels. Leave on the counter for at least 20 min. Mine could have stood to stay a bit longer but it was late. Then remove the towels and bake the rolls for 13-17 min. until golden brown. At this point she instructs us to make the maple icing while the rolls are baking. As I said before it was late so I decided I’d do it in the morning. I did sample these scrumptious little guys to make sure they would be suitable for my boys. Heavenly, I might even call them magical. Morning came and before I knew it my hubby and boys had devoured over half the rolls!! Without the icing!! Later Willis said he really like the rolls but he liked the store-bought ones better because they have icing on top. I explained that had they waited a bit longer they would have had their icing too! “Oh, well then, I like these more.” Lesson learned…stay up until you have finished making and covering these little beauties with icing. Check out Ree’s cookbook, where you will find the recipe for what I’m sure is a delightful maple icing which could be used on much more than the rolls. So on a scale of 1 to 10, just how do they rate in The Magic Farmhouse?? An easy 11…without the icing! DISCLOSURE: I’m in no way a cooking or baking expert and I did not use any magic LOL! However, I am the connoisseur of all things sweet and wow-wee these babies are to die for!